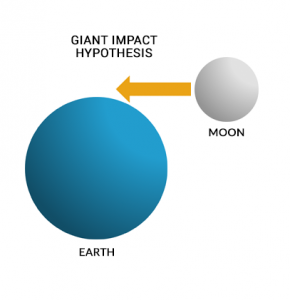 The giant impact hypothesis models the formation of our moon. It describes themoon’s collision course with Earth. This theory is identical to the “Theia impact” in which Earth is called “Gaia” and the moon is “Theia”. Scientists estimate the formation of the moon to be around 4.5 billion years ago. The Earth is constantly being bombarded by small asteroids and comets. But rare events are larger like the one that formed our moon. 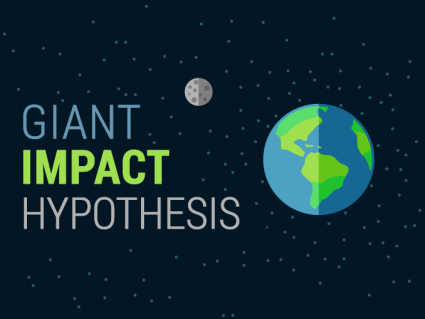 The “Giant Impact Hypothesis” starts with an object the size of Mars heading towards Earth. At tremendous speed, this object collides into Earth. It wasn’t a direct collision of the two protoplanets but more of a glancing blow. Earth’s planetesimal rock are ejected out into space. But the force of gravity prevents all the debris from flying too far away in space. Eventually, the leftover debris coalesce in orbit to form the moon. Ever since the giant impact, the moon has remained orbiting the Earth. And because of the giant impact, it tilted Earth on its axis promptly giving it seasons. The composition of the moon and Earth are very similar. One big difference is that the moon does not have as much iron. 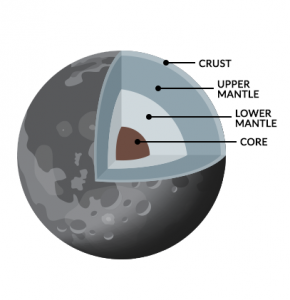 Scientists think that from the giant impact collision, the iron core of the moon got absorbed by the Earth. Also, less of the heavier elements like iron got thrown out into space. As the lighter elements from Earth were flung out into space, the moon absorbed them. Eventually, the moon became a dead cinder of rock orbiting the Earth. So not only does the Earth has more iron than moon, but it has a higher density. And measurements can confirm these conditions to be true about the moon. When was the formation of the moon? The Giant Impact Hypothesis took place about 4.5 billion years ago. This would put the formation of the moon at the start of the Hadean Eon. After the creation of our solar system about 5 billion years ago, this is when Earth felt the giant impact from Theia. This final source of heat for the Earth was very catastrophic. But it eventually regulated climate on Earth.